Ideal for the traveling image-maker looking for a lightweight solution with modifiers and power options, the Pocket Cannon Mini LED Daylight 3-Light Kit from Intellytech would work well. The kit contains three daylight-balanced LED lights, each with 4-way barndoors, a 5/8" mount, a cold shoe mount, a removable lens, an NP-F550 battery with charger, and an AC adapter. 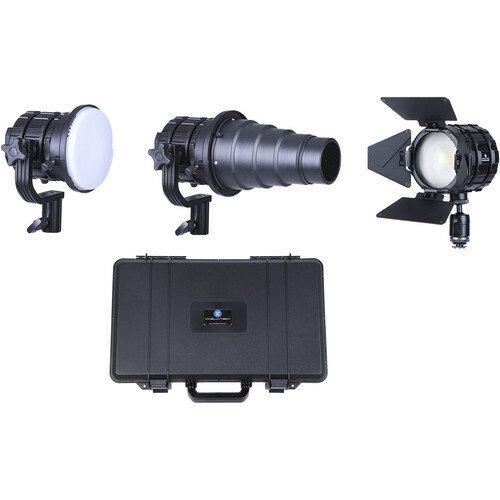 This kit also includes accessories, which consist of a softbox, a snoot with two removable patterns, a honeycomb grid, an adapter plate to attach modifiers, diffusion, orange, yellow, and blue filters. It all fits in the provided hard case.